Lookup tables for estimating the likelihood of poverty using the Poverty Probability Index (previously called Progress out of Poverty Index) or PPI from country-specific indicators collected from cross-sectional surveys. This lookup table is extracted from documentation of the PPI found at https://www.povertyindex.org. YYYY which is the specific year at which the country PPI table was released. These three components are joined together without any spaces or gaps. Some country lookup tables may have additional components to their name which are added after the year separated with an underscore. These usually signify that a lookup table released on a particular year has a subset table in which the poverty likelihoods for a given PPI score are reported based on a different poverty definition or cut-off. This additional component to the table name is usually a character value or alphanumeric and is usually country-specific. To know more about what this additional component to some PPI tables refer to, read the index table below of the PPI tables available in this package. Following are the available PPI country tables from the ppitables package. This is updated as at 23 November 2018 using information from the PPI site. To extract the actual PPI tables, the get_table() function can be used. 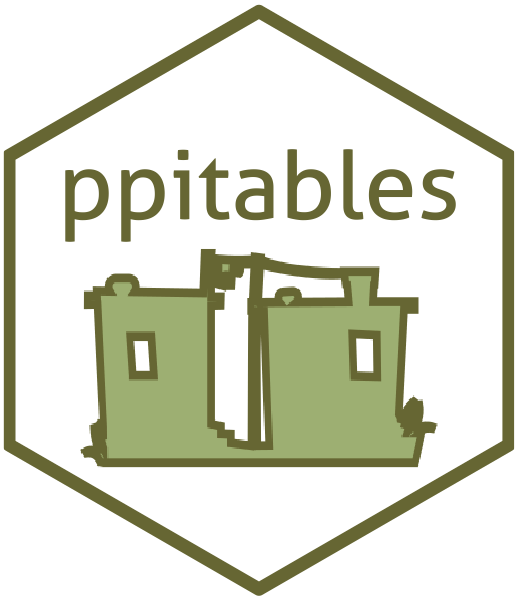 The get_table() function wraps around the find_table() function to make a search for a specific PPI table and then extracts the table/s and puts them together into a tidy data frame. Only 60 country PPI tables are shown here and available via the package. There is no lookup table for China because the China Poverty Scorecard is an expert-based scorecard. See this for futher explanation.